4.25" x 5.5" notecard featuring artwork by Christian Robinson from the book, When's My Birthday? Comes with coordinating envelope. 5" x 7" blank greeting card featuring image by John Tenniel from Alice's Adventures in Wonderland. Comes with a coordinating envelope in a clear cello sleeve. Brighten someone’s day with this greeting card featuring Lisa's colorful hand-lettering. Printed in soy inks on recycled (and recyclable) paper in the USA. Sweet card with text "I love you". Blank inside with coordinating envelope. Printed with soy inks on 60% tree free recycled paper. Card measures 4.25" x 5.5". Artwork by Yelena Bryksenkova. 12 cards featuring artwork by Andrea Wisniewski in a clear-topped box set with matching envelopes. 4.25" x 5.5" notecard featuring artwork by Christian Robinson. Comes with coordinating envelope. 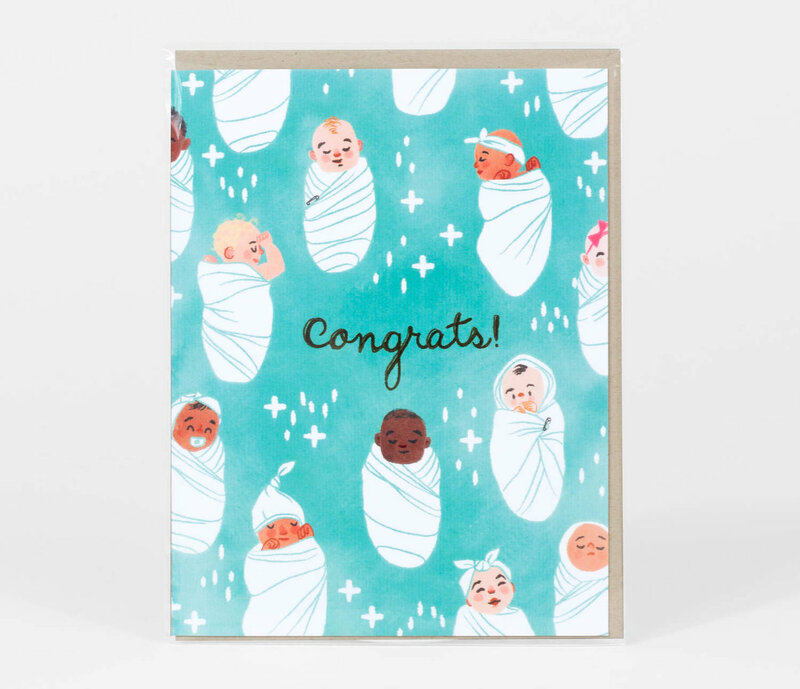 Blank card with coordinating envelope. Artwork by Sarah Burwash. Printed with soy inks on 60% tree free recycled paper. Card measures 4.25" x 5.5"
Christa Pierce is a children's author and illustrator from Portland, Oregon who spends her days in her home studio with her little dog, Sir Lancelot, dreaming up new stories and paintings to share. Greeting card printed with photo quality ink on acid-free, 120 pound white card stock, with a recycled brown paper 8-pound envelope. 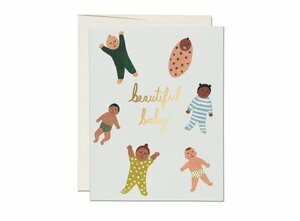 Card measures 4.25" x 5.5"
Features text "Hello Baby!" on front. Blank inside. Comes with coordinating envelope. Printed with soy inks on 60% tree free recycled paper. Card measures 4.25" x 5.5". Artwork by Becca Stadtlander. Card is blank inside and comes with a coordinating envelope. Made in the USA. 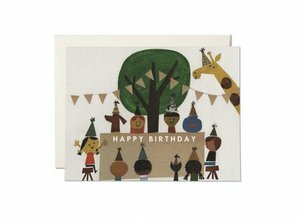 Measures 4.25" x 5.5"
Encourage someone with this greeting card featuring Lisa's colorful illustration. Printed in soy inks on recycled (and recyclable) paper in the USA. Brighten someone’s day with this greeting card featuring Lisa's chirpy illustration. Printed in soy inks on recycled (and recyclable) paper in the USA. 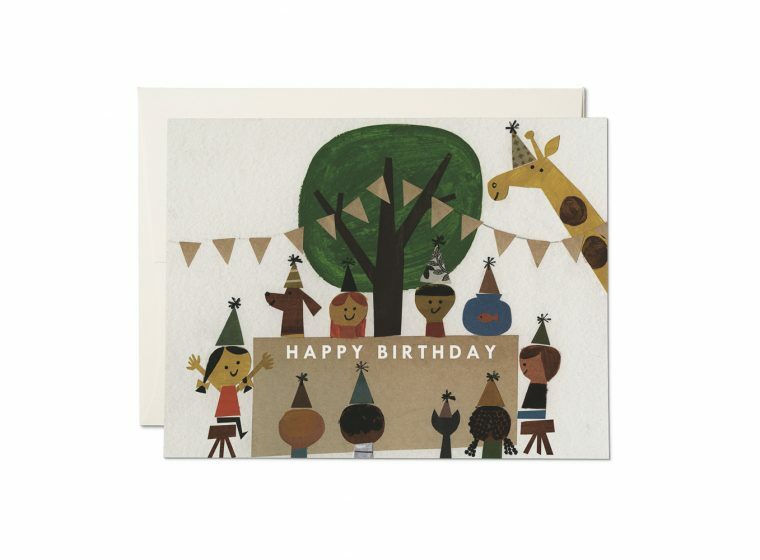 5" x 7" notecard featuring artwork by Kate Pugsley with coordinating envelope. Celebrate the seasons! This beautifully painted bucolic scene flows across the entire card and evokes a peaceful feeling from an imagined yesteryear. Comes with a white 100% post-consumer recycled paper envelope. Card measures 4.5 x 6.25"
Encourage someone with this bright and cheery greeting card featuring Lisa's hand-lettering. Glitter details in the raindrops & heart make it even better in person. Offset printed with soy inks on luxuriously heavy, bright white 100 lb. uncoated cardstock, card measures 4.5×6 inches folded. The interior of this card is blank. 6" x 4.5" Greeting card and matching envelope. Blank inside. Printed in USA with soy inks. Express your sentiment and your love of art with colorful note cards. 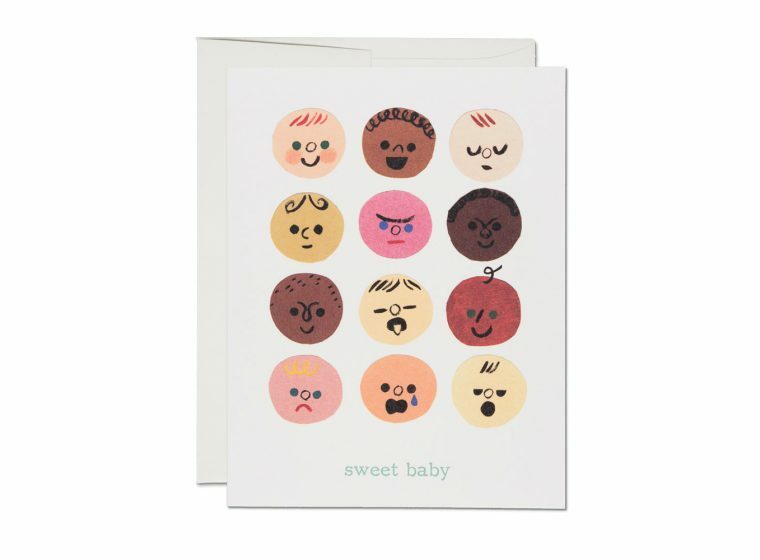 Whether your message is joyful, congratulatory, sympathetic, or celebratory, convey your feelings with a handwritten note. 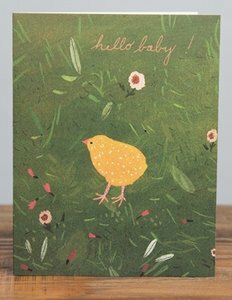 The beautiful shapes and colors of birds and flowers by artist Gennine make this 10-card set of blank note cards perfect for expressing a whole range of sentiments, from sympathy to congratulations or gratitude. Two of the artist's images are included in the set. Features text "Birds of A Feather" on front. Blank inside. Comes with coordinating envelope. Printed with soy inks on 60% tree free recycled paper. Card measures 4.25" x 5.5". 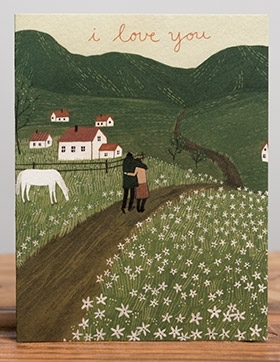 Artwork by Kate Pugsley. 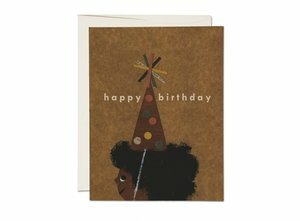 Send birthday greetings with this card featuring Lisa's colorful hand-lettering and illustration. Printed in soy inks on recycled (and recyclable) paper in the USA.